Hristos Se Rodi! Christ is Born! Badnje Vece at St. George church Clearwater was wonderful. The evening Vigil service was a joyous celebration of faith and tradition as the community gathered in church for the litya - with five loaves, wheat, wine and oil. The choir uplifted the service through their magnficint sining, and the service was completely full. 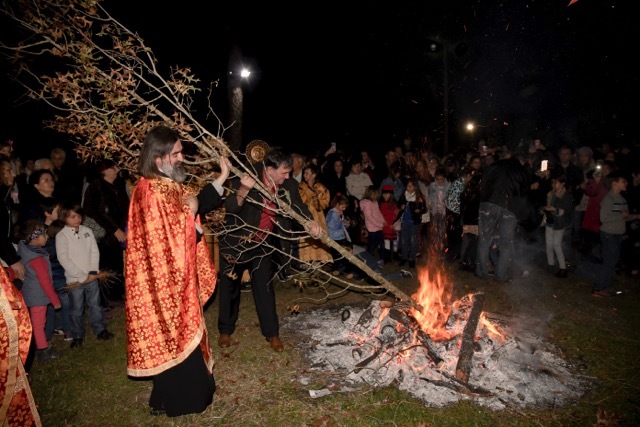 After the Vigil service there was a procession from the church to the area set aside to bless and burn the Badnjak, which is always carried by the church president. The parishioners gathered together in our cool Florida weather singing joyfully as the Badnajk was blessed by V. Rev. Fr. Jovan Todorovich with V. Rev Fr. Milan Stojanovich. Our parish priest V. Rev. Fr. Dragan was throwing the nuts, fruit and sweets to the extreme delight of our children. There was a great fireworks display that everyone enjoyed especially the children.The Kolo Sisters prepared a delicious Lenten supper for all to enjoy with their families, friends, neighbors and Kumovi. For many, the highlight of the evening was when Fr. Dragan brought out the Cesnica for the children. The children gathered, all excited to be the lucky one who might find the coin baked inside the bread. Three lucky children found the coins baked inside the Cesnica, and then Fr. Dragan gave them an extra surprise of $10. The smiles of the children faces as they anticipate finding the lucky coin was priceless, especially with all the parents with their cell phones trying to capture those special moments.